And My Favorite Anguilla Beach Bar Is …. 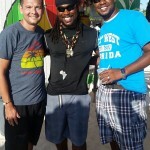 Home » Beach Bars - Anguilla » And My Favorite Anguilla Beach Bar Is …. Garvey’s Sunshine Shack. While Anguilla’s beach bars are numerous and there are more well-known ones, Garvey’s rises to the top as the crème de la crème for me. In essence, it’s what a beach bar should be – a color-splashed wooden shack surrounded by sand whose day to day proceedings are watched over by one of the most gregarious people you’ll ever meet. It’s not easy to get to – there’s really no road that leads directly to it. Access to the closest navigable road is a quarter mile down the beach at the Anguilla Great House where, along with the Cuisinart Resort, most of Garvey’s customers migrate from. Another option, which we chose, is to visit Dune Preserve and then walk east down the beach toward the Sunshine Shack. And if you’re lucky enough to be on a boat, you can just pull right up. Combined with the fact that there is no WiFi on this WiFi saturated island (you’ll survive – just put the phone down) and there are no other beach bars within shouting distance (the Dune Preserve is a speck on the horizon and the Cuisinart’s beach bar is at, well, a resort) and you have the feeling that you’re on a deserted island with no one but Garvey and all his new found friends to help you while away the afternoon. There are no crowds or lines to battle at the Sunshine Shack – only the end of another day and closing time. The arduous journey is worth it, though. While it may be the most difficult beach bar to reach in Anguilla, it’s also the most rewarding. 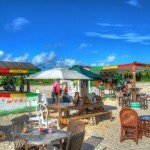 Spending an afternoon at the Sunshine Shack is like liming away the afternoon with your best friend. After meeting Garvey and being enveloped by his big personality and even bigger arms, you’ll wonder why his beach bar doesn’t get more love from travel publications. It may be because it sits on the same beach as Bankie Banx’s Dune Preserve. When a beach bar such as Bankie’s garners all the well-deserved press, it’s hard to compete against. That’s just fine. We’ll keep the Sunshine Shack as our little secret. I think Garvey’s just fine doing his own thing, though. He seems perfectly content with his beachfront outpost, a hodgepodge of plastic and wooden chairs, beach loungers, umbrellas and picnic tables dotting the sand covered landscape, offering a contrast to the gleaming white pristine structures just down the beach at Cuisinart. Anguilla needs that contrast, though. It has enough luxury high end choices to offer its discerning customers that sometimes a place like the Sunshine Shack is a welcome laid back kick-off-your-shoes respite. 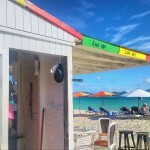 Garvey’s Sunshine Shack offers balance to Anguilla and I hope it never loses its place on the scales. While the Dune Preserve, the compound-like Anguilla institution with its seemingly never ending nooks and crannies and Elvis’, the king of the Sandy Ground beach bars and a favorite among many, come in as co-runners up, it’s Garvey and his Sunshine Shack that take the top spot for me as my favorite Anguilla beach bar. Its simple toes-in-the-sand surroundings and effervescent owner clinched it for me and my first reaction as I slogged through the sand to it like an oasis in the middle of the desert sums it up best: “This is what a beach bar should be.” Indeed it is. As noted above, it’s not easy but worth it. Have your taxi driver take you to the Dune Preserve where you can enjoy a couple rum punches before embarking on the hike to Garvey’s. If you need refreshment during your trek, stop by the Cuisinart’s beach bar and enjoy a frozen mojito. 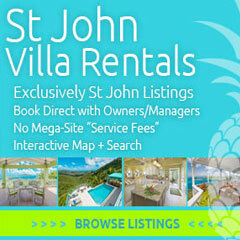 You can also go to the Anguilla Great House but don’t take the front entrance. 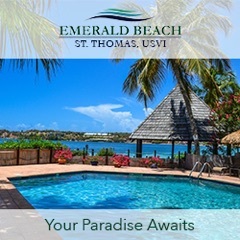 Take the road to the east of the property that runs between the resort and the salt pond. It dead ends at a small makeshift parking area and the Sunshine Shack is just about a quarter mile down the beach to the west. Or hop on a boat if you’re lucky enough. 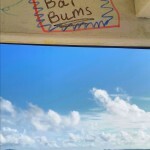 Keep an eye out for the Beach Bar Bums graffiti – our koozie adorns the walls along with my barely coherent scribbling. It was a long day of rum punches and vodka drinks. You made it to Anguilla!?!!! Sounds like you feel under the spell of Anguilla and fell in love. I’m a big fan of sunshine shack too. Did you make it to The Place? Its on the far eaat end of rendezvous. It’s what made rendezvous my favorite beach on the island. Hey, Mandy! Yes, we made it to Anguilla and I haven’t been able to get it out of my mind since then. Most definitely fell in love with the island and the people. I somehow missed The Place. Is that down by the Great House? It’s further east from the great house on the far end of rendezvous. Thanks for the info, Mandy! Yet another excuse to head back!